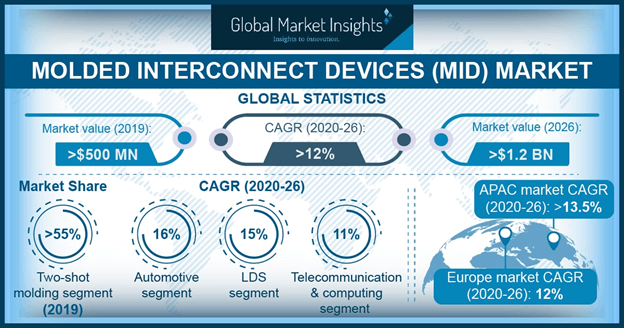 Molded Interconnect Devices (MID) market is poised to witness an accelerated growth over the ensuing years, amidst the backdrop of the frequent technological advancements in telecommunication sector. The ability of the device to facilitate miniaturization has largely added to the expansion of its application portfolio in a range of consumer products. MIDs have gradually become the prime circuitry solution choice in the automotive and electronics industry, owing to its easy assembling, smaller circuitry. and light weight when compared to conventional PCB circuits. It is prudent to mention that the eco-friendly tag that these devices carry is one of the major factors fueling the MID market growth worldwide. These devices reportedly incorporate thermoplastic materials that are recyclable and do not involve hazardous manufacturing processes. The growth of MID market has been greatly boosted by economies that rely on their manufacturing industry for growth, with the Asian economy – majorly China, South Korea, Japan and Taiwan in the lead. Touted as one of the major growth avenues in the MID market, China is estimated to contribute over $155 million to the MID industry by 2024, aided by the increasing demand for MIDs in the consumer electronics sector. China has achieved a rapid growth rate because of its ability to provide cheap labor for manufacturing industries, which has prompted many multinational companies to shift their manufacturing units in the country. The nation has now turned into a global manufacturing hub, with Apple setting one of the most prominent examples of this trend. The technology company with an expansive product portfolio comprising portable electronic devices that are more compact and reliable is an ideal target consumer for the MID market. China also boasts of other domestic tech companies who have recently began dominating the smartphone market owing to their competitive sleek devices, the One Plus flagship line being an example of this phenomenon. Not to mention, the region being a key automotive manufacturing hub hosting the presence of many international and domestic brands also adds to its strong contendership in the global MID industry fraternity. Japan is another prominent nation fueling APAC molded interconnect devices market growth. The region’s thriving automobile manufacturing industry is slated to be one of the top-notch regional drivers. With circuitry designed using MID facilitating the incorporation of these cutting-edge technological features, it is overt that APAC will be one of the most lucrative hubs for the MID market expansion. As per reliable estimates, overall APAC MID market is projected to surpass a valuation of USD 400 million by 2024. European nations have been renowned for their active participation toward ensuring environmental sustainability trends, making the continent one of the leading players in the MID market expansion. The MID Laser Direct Structuring (LDS) manufacturing process allows MID to be made via a single-shot molding process which is relatively less harsh on the environment than conventional methods. The continent’s expanding vehicle manufacturing sector in tandem with the presence some of the world’s major automotive OEMs is expected to boost the Europe MID market share in the coming years. The rapid technological advancements with regard to automotive safety such as seatbelt safety systems and sensor positioning will further provide massive growth opportunities to the MID industry players. The regional demand is slated to record a CAGR of about 10.5% from 2018 to 2024. Besides the consumer electronics and automotive sectors, one of the most anticipated trends in the MID market remains the contribution of healthcare fraternity to this space. With rapid R&D investments toward healthcare prototyping gaining prominence, the sector is certain to be a profitable end-user for the molded interconnected devices manufacturers. Global Market Insights, Inc. forecasts the healthcare MID industry to record an appreciable double-digit CAGR of 15% over 2018-2024. This entry was posted in Electronics and Media and tagged Automotive, Computing, Consumer Products, Healthcare, Industrial, Laser Direct Structuring, LDS, Military & Aerospace, Molded Interconnect Device Market Forecast, Molded Interconnect Devices Market, Molded Interconnect Devices Market Growth, Molded Interconnect Devices Market Research, Molded Interconnect Devices Market Share, Molded Interconnect Devices Market Size, Telecommunication), Two Shot Molding. Bearings market size is expected to exceed over USD 142 billion by 2022, as it will grow over 7.6% in the coming years. This product is an essential mechanical component for proper and smooth running of vehicles and machineries. The industrial heavy machinery sector is the largest end user market, followed by automobile sector which can’t run without this product. The future growth of this market will come with an increase in requirement in aerospace and railway sectors. Asia Pacific is the greatest and fastest rising market in this sector, followed by China. Asia Pacific market was USD 36 billion in 2014 and is projected to gain USD 68 billion by 2022 with a CAGR of 8% between years 2015-2022. Increase in number of commuters taking advantage of public transportation is likely to be the key facet of rise in demand. Substantial growth is expected in this market because of high requirement for tapered roller components in wheels, gearboxes and journal applications along with ceramic coated ones used in traction-motor. They have small surface contact thus help in reducing friction which makes vehicle run smoothly and hence its demand can’t fall in future. It has a rising growth with approximately 42% of the overall share in 2014 and is expected to enjoy 78% in the coming year. The market trends seem to be promising in future. Automotive bearing market is projected to get significant gains with projection of USD 71 billion at a CAGR of 7.3%. An upsurge will be seen in agricultural sector as it is likely to grow with a CAGR of 7% because of economic recovery and improved performance. Machineries used for agriculture are also estimated to contribute in the elevation of this market. But yes, it is worth to notice the importance of the roller variety. They are mainly used when load enduring capacity is more important than speed. As per the market report, roller range is estimated to touch USD 51 billion up to 2022. It is anticipated that Europe will achieve USD 32 billion by 2022 which was USD 18 billion earlier in 2014. One more example of rising market for this product is North America which is expected to get USD 25 billion by 2022. Bearing market share is highly productive. The list of top most companies includes Timken, NSK Global, SKF, Schaeffler Group, JTEKT and NTN Corporation and these companies are contributing almost 60% of overall industry share. However, counterfeiting is a major problem which can be challenging to this market in near future. It is a problem faced by many industries and is a threat for them. This entry was posted in Automotive & Transportation and tagged Automotive, Ball Bearings, Bearings, Bearings Market Size, Roller Bearings. Gas sensors market is one among the few vibrant business spheres where innovations and technology quite aptly outline the key to profitability and opportunities. The industry participants are thoroughly investing in research activities to bring product improvisations in terms of advancements and sustainability quotients, that in extension is enhancing the product and commercialization matrix of this fraternity. Backing the fact with a recent case in point – Sensirion AG, a leading manufacturer of high-end sensors, has bestowed the marketplace with novel gas sensors that are not only technologically progressive, but are also environmentally viable. As claimed by the experts, Sensirion’s upgraded solutions offer precise air quality information based on some of the major environmental grounds such as VOC content, humidity, carbon dioxide presence, temperature, and particulate matter content. Undoubtedly, such exemplary initiatives undertaken by the renowned giants with regards to environmental sensing have opened up a slew of lucrative opportunities for gas sensors market players, in terms of commercialization and sustainability. In terms of revenue, Global Market Insights, Inc. reports the global gas sensors industry to have surpassed a valuation of USD 2.5 billion in 2017. Safety measures, of late, have become an integral axiom in the manufacturing space, subject to the stringent regulatory framework regarding workplace safety and health hazards due to poor air quality. Gas sensors industry trends is heavily influenced by the growing governmental initiatives across the world. Companies involved in gas sensors industry are introducing innovative application-specific components that comply with the safety standardization such as CSA and ATEX. In this regard, it is important to note that majority of these air quality standardizations and norms are implemented in industrial and automotive sectors. For instance, EPA’s Clean Energy Act has already set limits on some of the air pollutants, that is claimed to be hazardous for the environment. The act also gives the EPA the power to limit harmful emissions of air pollutants from sources like utilities, chemical plants, and steel mills. These mandatory roll-outs have left a huge impact on gas sensors market penetration, subject to the fact that these aforementioned sectors are mandated to install gas sensors in the plants to curb air pollution by efficiently regulating harmful emissions. 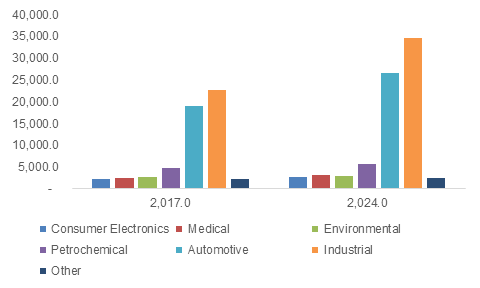 The expanding automobile sector and rising trend of automation across a myriad range of domains are chronicled to be some of the major factors driving APAC gas sensors market size. Reportedly, China and India are anticipated to be the major revenue pockets for APAC gas sensors industry. The growth in these regions can be primarily credited to the phenomenally increasing technological developments with regards to curtailment of hazardous air pollutant emissions. Allegedly, China has been remarkably incorporating miniaturized and wireless sensors to enable convenient detection of toxic gases. Moreover, the growing urbanization and demand for technologically upgraded products such as E- compressor and E-turbo is further fueling China gas sensors market share. Beijing and Shanghai are touted to be pivotal contributors to the rapidly deteriorating outdoor air quality, that exceeded the set particulate matter concentration by the WHO by a substantial proportion in 2017, which has further impelled China gas sensors market. However, in parallel to these developments the industry is also facing some major challenges with the exponentially increasing number of CO and CO2 sensors. The overcrowding of these devices has not only impacted the strategic landscape but has also raised a question on the product differentiation and innovations with regards to these sensors. Keeping this into consideration, the market players are vigorously investing in R&D activities to offer a diversified range of products, addressing the innovation and feasibility parameters. Some of the prominent names in the industry include Amphenol Corporation, Dynament, Bosch Sensortec, City Technology, Figaro Engineering Inc., Honeywell International Inc., Teledyne Technologies Incorporated, Trolex Ltd, and Siemens AG. With the expanding application spectrum of gas sensors industry across a myriad range of sectors including consumer electronics, medical, environmental, petrochemical, automotive, industrial and the increasing trend of wireless and miniatured devices, it is overt for this business space to record commendable gains in the ensuing years. Statistics project the global gas sensors market size to surpass USD 3 billion by 2024. This entry was posted in Electronics and Media and tagged Automotive, Carbon Dioxide, Carbon Monoxide, Catalytic, Consumer Electronics, Electrochemical gas sensors market, Environmental, Gas Sensors Industry, Gas Sensors Market, Gas Sensors Market Size, Global Gas Sensors Market, Industrial, Infrared, Medical, NOx, Oxygen Gas Sensors Market, Petrochemical, PID, Semiconductor, Solid State, Wired, Wireless.